After the latest upgrades on my gentoo vserver system running a 3.3.0 Linux vserver-kernel (vserver-sources-2.3.3.1), the system did not start up properly anymore. No kernel modules got loaded and even the network devices have not been available after a reboot. This is more or less the worst case, since then one has to be physically in front of the machine and can not repair the system via ssh remote login. Mar 21 17:20:09 mittelerde /etc/init.d/udev-mount: Udev uses a devtmpfs mounted on /dev to manage devices. Mar 21 17:20:09 mittelerde /etc/init.d/udev-mount: in the kernel configuration. With the information “CONFIG_DEVTMPFS=y is required” the log contains the necessary hint to get things to work. The CONFIG_DEVTMPFS option had to be enabled in the kernel. Afterwards the kernel has to be recompiled. The option can be found in menuconfig under Device Drivers-> Generic Driver options and is called Maintain a devtmpfs filesystem to mount at /dev. For getting the devfs automatically mounted at boot time it makes sense to also enable the option Automount devtmpfs at /dev, after the kernel mounted the rootfs (CONFIG_DEVTMPFS_MOUNT). It is safe to enable these options with older udev versions. Doing so protects your system from not working any more when you get the udev update later. Using nvidia linux drivers from version 270.X to 275.X with some graphics boards, in example the Quadro FX 350M which is built into the Dell Precision M65 notebook, resulted in a black screen or window for OpenGL applications. Even glxgears did only output a black window. The problem has been discussed on forums.opensuse.org. A downgrade to a lower driver version, in example the version 260.X drivers is not applicable anymore, since these drivers do dot build against a recent linux-3 kernel. A upgrade to newer drivers also was not possible, since driver versions from 285.X to 295.10 did not work at all for this graphics board. Recently version 295.17 of nvidias beta driver has become available, which solves this issue. Download links are available on nvnews.net. Afterwards you may emerge nvdidia-drivers-295.17. A few days ago nvidia-drivers-270.41.06 appeared in the gentoo partage tree. During my regular updates it got installed. Afterwards turonice did not work anymore with the configuration I wrote about in zen-sources-2.6.38_p20110501 with tuxonice. Freezing processes & syncing filesystems. Freezing user space processes … (elapsed 0.01 seconds) done. Freezing remaining freezable tasks … (elapsed 0.01 seconds) done. Freezing user space processes … (elapsed 0.00 seconds) done. – Overall expected compression percentage: 50. Used 0 pages from swap on /dev/sda6. – Max outstanding reads 1. Max writes 0. Memory_needed: 1024 x (4096 + 360 + 112) = 4677632 bytes. Free mem throttle point reached 0. Swap available for image: 2098481 pages. Storage available for image: 0 pages. – No I/O speed stats available. – Extra pages : 0 used/500. – Result : Hibernation was aborted. : Freezing filesystems and/or tasks failed. Somehow there seems to be a problem with nvidia-drivers-270.41.06. After downgrading to nvidia-drivers-260.19.44 tuxonice worked as usual. As I promised in New version of the vr920 headtracking driver coming soon here is the new version of my headtracking driver for the Vuzix VR920 iwear for Linux. It calculates yaw, pitch and roll from the accelerometer and magnetometer data (The device has got three of each). This makes a 3DOF tracking possible and allows you to look around in a 3D Scene. In example you can use the driver with my stereoscopic image viewer SIV. The driver averages the sensor readings with an improved algorithm, which gives a far smoother experience than with the initial driver version. The driver package consists of a daemon which can be run in the background and for convenience a basic control application that enables one to easily tweak the various driver settings and to callibrate the device. For general Information on how to use the device with Linux see: Vuzix VR920 with Linux and active 3D stereo. Yaw, pitch and roll are angles from 0 to 360 degrees. X, y and z are always zero for the vr920, since it only supports three degrees of freedom. These values are reserved for future devices which may support six degrees of freedom, in the hope to propose a standard for tracking devices. The driver can scale the readings and invert the axes independantly to get the needed value range for the used application and a pleasant experience. The driver emulates a joystick device /dev/input/jsX. The readings for yaw, pitch and roll are the X,Y and Z axis of the emulated joystick. This may be used to enable basic headtracking support in games that do not natively support headtracking. The driver emulates a joystick device /dev/input/mouseX. The readings for yaw and pitch are being translated to X and Y of the mouse device, so when you look right the mouse pointer moves to the right and when you look up the pointer moves upwards and vice versa. This may also be used to enable basic headtracking support in games that do not natively support headtracking. It can also be used to just control the mouse pointer of the window system. Controlling the viewport of the window system can also be a resonable purpose. With the new MPX extension in xorg this may be possible. In UDP mode the driver sends the tracking data via network as UDP unicast. The approach to send the data out via network makes the language used for writing the application independant from the language used for developing the driver. The packet sent to the clients contains the three angles, yaw, pitch and roll and x,y and z as 32 bit fixed point in Q16.16 format. This mode may i.e. used to control flightgear. In multicast mode the driver sends the tracking data via network as UDP multicast, thus many clients may read the data, which makes parallelization more possible, i.e. one could use one machine for rendering and another machine for calculations. In addition to this, the approach to send the data out via network makes the language used for writing the application independant from the language used for developing the driver. The tracking data sent to the clients contains the three angles, yaw, pitch and roll and for easy usage a viewmatrix, one can directly use with scenegraph libraries. If you intend to develop an application using the headtracking of the VR920 see the file democlient.cpp included in the download for details on how to get the data into your application. This mode is used by the stereoscopic image viewer SIV. 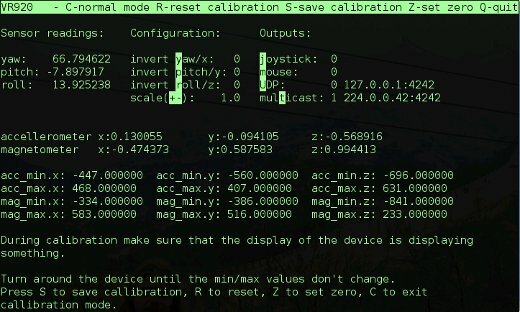 Important note: During calibration make sure that the display of the device is displaying something. Since the displays not only showing a blue screen influences the sensor data (at least with my device) you’ll end with wrong calibration else. You may use i.e. nvidia-settings to ensure this. For detailed usage instructions see the readme included in the download. You need to have libusb, libconfig++, libfuse and libcurses installed on your system. For ubuntu users I included the small shell script ubuntu_install_deps.sh that installs the dependencies. Maybe it works also for for other Debian-based distributions. Gentoo users just have to make sure that libusb, ncurses, fuse, and libconfig have been emerged. Your kernel version has to be at least 2.6.31 and you must have cuse enabled in your kernel.